The large group who made the pilgrimage from Fethard to the Holy Year Cross on Slievenamon last year. 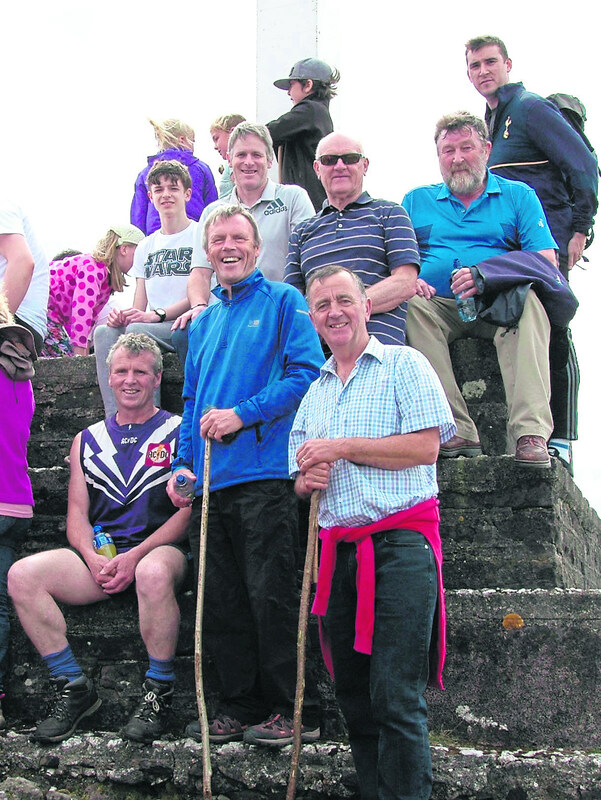 The annual pilgrimage to the Holy Year Cross on Slievenamon from Fethard will take place on Sunday, August 12. The annual parish pilgrimage to the Cross takes place each year on (or nearest suitable date) the Feast of the Assumption of Our Lady. The Holy Year Cross was erected by the people of the parish to commemorate the Marian Year and was blessed by the late Rev. Patrick O’Donnell, Archbishop of Brisbane, Australia, on August 15, 1950. FETHARD TO THE HEART AND CORE. Some of the hardy boys who completed last year's pilgrimage. It is always a great and proud occasion for the local people of Fethard and environs carrying on a proud tradition from generation to generation. And of course the rewards at the summit justify the effort involved, the satisfaction of participating in a traditional pilgrimage and the beautiful views over south Tipperary and into near and far distant counties on a good day.